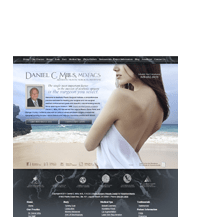 Daniel C. Mills, MD understands that breast augmentation and other cosmetic enhancement of the breasts is a major decision, and he will be happy to answer your questions about treatments that may help you meet your goals. For more information or to schedule your private consultation, please fill out the fields below to contact our practice. We look forward to hearing from you! This message is confidential and intended solely for the use of the addressed individual or entity. Access to this e-mail by anyone else is unauthorized. Any review, retransmission, dissemination, copy or other use of or taking of any action in reliance upon this information by persons other than the intended recipient is prohibited and may be unlawful. Aesthetic Plastic Surgical Institute, Inc. accepts no liability for the content of this message or for the consequences on any actions taken on the basis of information provided, unless the information is subsequently confirmed in writing by an authorized representative of the Aesthetic Plastic Surgical Institute, Inc. Although the Aesthetic Plastic Surgical Institute, Inc. has taken reasonable precautions to ensure that no viruses are present in this message, Aesthetic Plastic Surgical Institute, Inc. cannot accept responsibility for any loss or damage arising from the use of this message.